It is impossible to talk about the glory days of Formula 1 in the 1960’s, without referencing the name, Brabham. Sir Jack Brabham, to be precise, was not only the first driver to be knighted for his contribution to motorsport, but was also the very first (and still only) driver to win the World Championship from behind the wheel of one of his own cars. Evident in his designs and technological innovations, the Australian was not only a world class driver but a brilliant engineer who significantly shaped the sport that we know today. His partnership with Ron Tauranac led to the production of over 500 Brabham race cars from the team’s Surrey garage alone. Throughout the 60’s Brabham was, in fact, the world’s largest manufacturer of open wheel racing cars. The vehicles not only made their mark in Formula 1, 2 and 3 but also competed in the Indianapolis 500 and in Formula 5000 racing. Whether you were behind the wheel of a Brabham, a Lotus or a BRM, there’s no denying that the 60’s were a pivotal decade of transition for the world of motorsport. Racing was raw, aggressive and dangerous. The 50’s had been an era where arguably, the focus and responsibility for an outcome had rested mostly on the shoulders of the driver and his skill. The 60’s, however, brought the performance of the vehicles boldly into the spotlight; and the sport became a genuine partnership between driver and machine. It truly was a season of massive transformation. The tide of innovation was unstoppable. The race between garages became just as vicious off the track, as it was on it. The cars were getting lighter and faster. Sadly, the speed of change meant that safety standards were struggling to keep up. For example, it took an incredulous amount of lobbying from Jackie Stewart, having only narrowly survived a near fatal accident at Spa, for the basic seatbelt to be introduced in the early 70s. This disproportionate growth between innovation and safety upgrades made racing in the 60’s an incredibly dangerous sport. It could be argued that these were indeed the most dangerous years inside the cockpit. The decade sadly saw the loss of some of the greatest drivers of all time, including the legendary Jimmy Clark, Lorenzo Bandini, Piers Courage and posthumous World Champion, Jochen Rindt. The fourteen fatalities of this deadly decade in motorsports were a heavy price to pay for innovation, but eventually drove improvements in design, including fuel tank positioning, chassis construction and even the introduction of the full face helmet. Efforts were also made to contain the risks by limiting the maximum engine capacity of the vehicles from 2.5 litres down to 1.5 in the early 60’s. Perhaps one of the most pronounced changes to vehicles in the 60’s was the transition from front engine designs to the rear engine, lighter constructions. Towards the end of the decade, the tyres had also become wider, and garages were beginning to experiment with tread patterns. By the 70s, aerofoils or wings had also been introduced- although not without significant controversy. Always at the head of innovation, the Brabham garage had cruised into the decade (and onto the podium) with the famous Cooper Climax, which comfortably led the pack with its mid-engine design, able to reach speeds of almost 300 km/h. The Climax was subsequently challenged in 1961 by the rise of Scuderia Ferrari who produced the Tipo 156, with the trademark shark nose that took quickly to the head of the field. The Tipo dominated across almost all tracks with the exception of Monaco and Nurburgring, whose challenging curves opened opportunity for the resourceful Stirling Moss. The British responded loudly in 1962. BRM and Climax rolled onto the track with an eight-cylinder engine. There had been transformation across the entire grid. The carburettor engines were replaced with fuel injection engines, and aviation fuel had been replaced with commercial grade petrol. Speedometers hit new marks. 1962 was also the year that Lotus brought to life the first ever Monocoque chassis. The design increased protection to the driver, changed his positioning and also influenced changes to the steering column (away from the large wooden wheels of previous eras). By the mid 60s the engine powers had risen to 220hp. Despite limited capacity, garages remained undeterred from constructing up to 12 and 16 cylinder cars. Not influenced by the pack, Jack Brabham out drove the field on his 8-cylinder Brabham Repco; which in the end, proved to be the most reliable of all the new engines. Still, it wasn’t long before the trusty Repco was to face the challenge of the historic DFV type Ford V8 engine. Unstoppable from it’s very debut at Zandvoort in June 1967, the world will never forget the thrill of watching Jimmy Clark drive the car into the history books. It is no surprise that this legendary decade- fraught with danger, overflowing with innovation and heavy with history- has become a coveted golden era for motorsport collectors. To own a vehicle (or memorabilia) from this pivotal time in racing, is a desire beyond nostalgia. It is about placing one’s hands onto a patch of history, too incredible to hope that we may ever see again. 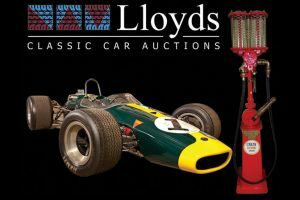 Alstonville collector, Brian King is the owner of the coveted “King’s Garage”, which in a rare barn-yard find, unearthed a historical pair of Brabham race cars now going up for auction, along with other historic race cars and memorabilia by Lloyd’s Auctions on March 18th.